* The free plan provides temporary SSL links that expire in 24 hours. The IcoMoon app stores every change and the state of the app in the browser locally. You could also manually save/load project files as JSON files. To learn more, read the docs. You could subscribe to our premium service to get permanent links. This feature makes development a lot easier as every change you make to your font will get applied on the fly and you won't need to update your CSS. Quick usage links provided by the basic plan are perfect for development. To get extra links suitable for hosting, consider the unlimited plan. By default, the IcoMoon app stores everything locally, in the browser. If you clear your browser's cache, you may lose this data. By becoming a premium member, your projects will be safely stored in your account, allowing you to access them from different devices/browsers. We keep periodic backups of this data as well. 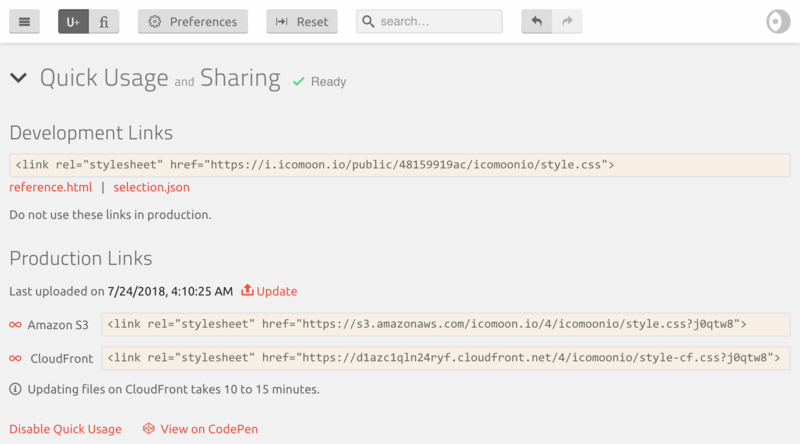 By subscribing to IcoMoon's unlimited plan, you will be able to easily host any number of icons (in both font and SVG formats), with any number of requests, on Amazon S3 & CloudFront. Using this service, you won't have to worry about gzipping, CORS settings, caching headers, or correct MIME types. We take care of all of that for you. Get a full refund up to 15 days after your first purchase. No questions asked. You have to be logged in before making a purchase. You could use a credit/debit card or a PayPal account. You will only get charged once. To extend your subscription, you can make another purchase while you're logged in to your account. The number of days you pay for, gets added to the remaining days on your account. We won't charge you automatically, but you will receive email notifications before your premium plan expires. To get an invoice, please contact us after making your purchase. Have any questions? Use our contact form.